You can become a healer, teacher, visionary or warrior of light. You can feel on track with your purpose. 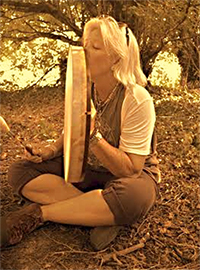 Kerry uses ancient indigenous techniques to foster healing of modern minds and spirits. Through ritual it is the shaman’s intent to restore wholeness to body, mind, spirit and Soul. Kerry fuses both the past and the future into a powerful vortex of presence, that is as revealing as it is enlightening. She shares her vast practical experience of ancient teachings through her application of this knowledge to our modern-day world and lives. bringing heaven & earth, spirit and human-kind together. Find the courage to create your own change and well-being - restore lost connections with your authentic self. Live freely from your authentic/true self, where divine guidance comes from within and where life expands into a playful place of infinite, creative possibilities. Experience a message from the Arcs, the collective intelligence of the angelic realms, channelled through Kerry. Discover how you can participate in Kerry's global healing work. "Kerry is a wealth of knowledge on so many levels - she is enthusiastic, authentic, has a fearsome heart for service, and is a whole lot of fun as well. If these trainings call to you, peak your interest just a little bit, or draw you right in, don't hesitate, just do it. You will be so happy you did." If you would like to schedule a session or learn more about my work, please e-mail me at kerryshaman@aol.com or call me at 760-831-1583.